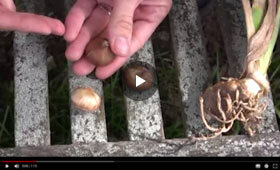 There are two basic methods for planting bulbs. Using a garden trowel or bulb planter, dig individual holes for each bulb. 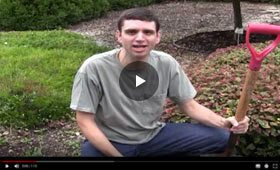 Loosen the soil to a depth of 6-8" and add some bulb fertilizer. Most bulbs have a visible growing point, which should face upward. As a general rule, bulbs should be planted as deep as 2-3 times the height of the bulb. Place your bulb in position in the hole and cover it with loose soil. If planting a quantity of bulbs in a single area, dig an entire bed to planting depth. Place the bulbs in position, cover with soil and water. Bulbs need plenty of water and good drainage. They require only minimal care during their blooming period. Like all garden plants, they appreciate a weed-free growing area and watering when nature doesn’t supply enough rain to keep the soil moist. Do not let water stand around your bulbs. Hardy bulbs, such as tulips and daffodils, that stay underground year round, should be protected by mulch in winter. After blooming season is over, do not cut back the leaves. Let the foliage yellow and die down naturally. The leaves provide nourishment to the bulb to produce next year’s blooms. Summer-flowering bulbs such as dahlias, begonias, gladiolus, cannas and calla lilies are less hardy in colder climates and should be lifted each fall. Lift bulbs prior to a killing frost or as soon as the frost has blackened the foliage. Dig up the bulbs gently, being careful not to cut or damage them. Store them in a well-ventilated, frost-free area until the foliage has dried. Remove the foliage and place bulbs in an unsealed paper bag, old nylon stocking or a shallow, plastic-lined box with a blanket of peat moss or vermiculite. Summer-flowering bulbs require winter storage temperatures between 35-45°F. An ideal storage location would be an unheated garage or cellartype basement. Most modern basements aren’t cool enough for winter bulb storage.